President Tsai Ing-wen has stated that she does not exclude an attack on Taiwan from mainland China amid heightened cross-strait tension. The remarks follow an increasing number of Chinese military drills near Taiwan. Tensions have risen following the election of Tsai Ing-wen, who belongs to the Democratic People’s Party, which has historically espoused Taiwanese nationalism. While China says that the drills are routine, they also maintain they will not tolerate any declaration of Taiwanese independence. President Tsai said that the Taiwanese military is following every movement and action in the scope of its monitoring of Chinese activity near the region. 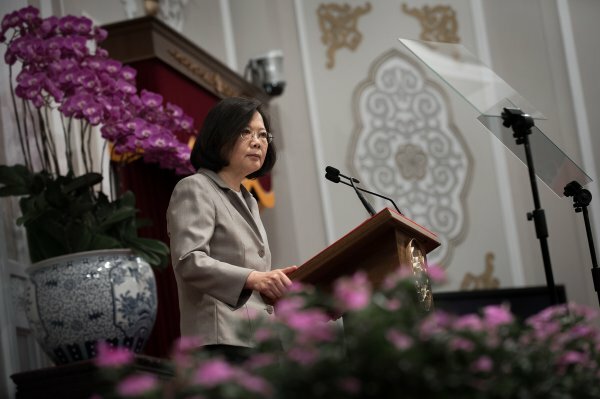 Taiwan President Tsai Ing-wen said that she does not exclude the possibility of China attacking the self-ruled island, amid heightened tensions between the two sides including an increasing number of Chinese military drills near Taiwan. Beijing has taken an increasingly hostile stance towards Taiwan, which it considers a breakaway province, since the election two years ago of Tsai of the pro-independence Democratic Progressive Party. China suspects Tsai wants to push for formal independence, a red line for Communist Party leaders in Beijing, though she has said she wants to maintain the status quo and is committed to ensuring peace. In recent months, China has stepped up military drills around Taiwan, alarming Taipei. China says the exercises are routine, but that it will not tolerate any attempt by the island to declare independence. "No one can exclude this possibility. We will need to see whether their policymakers are reasonable policymakers or not," Tsai said in an interview on Taiwan television broadcast late on Monday, when asked whether China could attack Taiwan. "When you consider it (Taiwan-China relationship) from a regional perspective, any reasonable policymaker will have to very carefully deliberate as to whether launching war is an option," Tsai said. "When our government faces resistance and pressure from China, we will find our method to resist this. This is very important," she added. "In terms of China circulating around Taiwan or carrying out other military activities, our military is carefully following every action and movement in the scope of its monitoring," Tsai said. "Our military is very confident to face these situations." China considers proudly democratic Taiwan to be its sacred territory and has never renounced the use of force to bring it under Chinese control. Taiwan and China have also traded accusations this month about China's opening of new civilian aviation routes close to Taiwan-controlled islands in the Taiwan Strait. Although China has cut off a formal dialogue mechanism with Taiwan, Tsai acknowledged that both sides currently have a method for communications to avoid misunderstanding. Taiwan has been pressing for the United States, its main source of arms, to provide more advanced equipment, but has also been trying to bolster its own weapons programmes, to avoid what Tsai termed "certain political difficulties" that come with buying weapons overseas in the teeth of Chinese opposition. Tsai said she believed one day Taiwan would be able to produce its own submarines, an item Taipei has long pressed for to face China's navy. China's Taiwan Affairs Office did not immediately respond to a request for comment on Tsai's remarks.